Vancouver lawyer Georgialee Lang has edited a book about eight Canadian Christian women leaders. 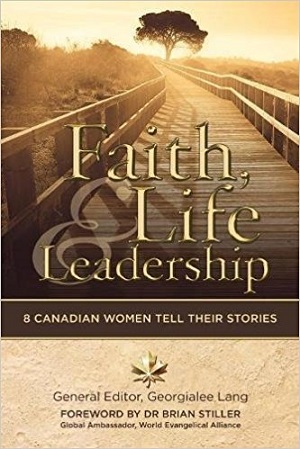 Lang is featured – the excerpt below suggests the truly unique and inspirational nature of her story – in Faith, Life and Leadership, along with Carolyn Arends, award-winning singer, songwriter and author from Surrey; Deb Grey, from Qualicum Beach, former Member of Parliament and Order of Canada recipient; and five others from across the nation. Every dream starts as an idea – a seed thought – that requires time to incubate, sprout and grow. The idea for a book on Canadian women in leadership, their stories and life lessons, germinated from discussions between Lorna Dueck and Margaret Gibb over 10 years ago. “Wouldn’t it be great if . . .” guided their conversations, culminating in the conviction that a book on faith-driven leadership would be a gift of encouragement to women who found themselves blessed and challenged with opportunities they never expected. In the summer of 2014, a newsfeed on social media caught my attention. Margaret Gibb was coming to Kelowna, British Columbia, where my husband and I spend our summers. All I knew about Margaret was that she was a well-respected Christian leader from Ontario. I also knew I had to meet her. As we sat in the warm Okanagan sunshine, we felt an immediate kinship and, as women often do, began sharing our lives – our experiences, our challenges and our hopes and dreams for the future. One of her dreams matched one I had nurtured for several years: to assemble a group of Canadian women to share their stories – their journeys of faith, life and leadership. We envisioned stories of ordinary women who stepped out of their comfort zones to achieve extraordinary accomplishments but received so much more. We could never have imagined the panoply of life and leadership journeys that emerged and the recurring themes that ran through their pages of transparent narrative. Our contributors come from diverse walks of life and professional roles, including politics, law, entertainment, social services and non-profit sectors. Their paths to leadership unite them as they share stories of grappling with confidence and self-esteem, pursuing excellence through lifelong learning and education, balancing career and family life and overcoming failures. One theme arises above the others, and that is the simple truth that it is through God’s grace that each of these women overcame stumbling blocks to persist and pursue their dreams and, along the way, became leaders. There’s nothing like Vancouver in June: lush trees with whispering leaves and birds humming, all amid a blue sky gleaming in the sunlight. It was a perfect day for a drive, and I remember sitting in the back seat of a vehicle winding down a steep hill, expertly maneuvered by a blue-suited police officer. I was in a cruiser with my neck stretched toward the window as a foreboding brick and steel structure, built in 1912, came into view. It was my new home: Oakalla Prison for Women. The year was 1974. Almost 40 years later, there was another car ride. This trip took me along the elegant Rideau Canal in Ottawa on a windy, drizzly day in autumn, the rain almost obscuring the tangerine, yellow and scarlet landscape that flanked the waterway. This time I peered through the foggy windows to see a magnificent art deco structure with massive gleaming golden doors. No, it wasn’t the Land of Oz; I had arrived at the Supreme Court of Canada. I closed my umbrella and walked across the polished marble of the great hall to attend a private cocktail party at the invitation of Chief Justice Beverley McLachlin. You may be thinking, how do you journey from a women’s prison to the halls of the highest court in the land? There is only one way: through God’s grace. Georgialee Lang has been a trial and appellate lawyer for 28 years. 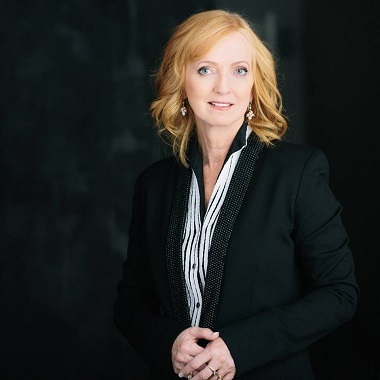 A graduate of UBC’s law school, she is a Canadian leader in the family law bar and was recognized in 2013 with a prestigious Lexpert Zenith Award, making her one of 60 Canadian women lawyers honoured for leadership in the profession. She has been selected as Best Lawyer in Canada in family law for the past 12 years. Three appearances as counsel in the Supreme Court of Canada have been the highlight of her legal career. She attends Broadway Church in Vancouver. 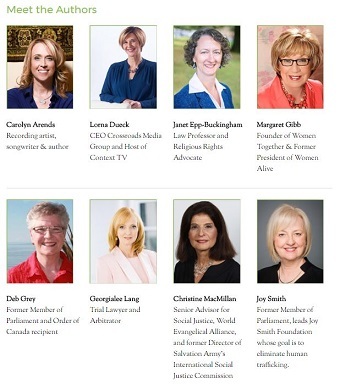 Eight women are featured in Faith, Life and Leadership. Along with Georgialee Lang, Carolyn Arends and Deb Grey, Faith, Life and Leadership features Ontario’s Lorna Dueck, CEO of Crossroads Communication, host of Context TV and columnist for the Globe and Mail; Joy Smith, from Manitoba, former Member of Parliament and founder of the Joy Smith Foundation, whose mission is to stamp out the trafficking of women and girls; Ontario’s Margaret Gibb, ordained minister, former CEO of Women Alive, and presently CEO of Women Together, a ministry that encourages and supports women across Canada and around the world; Janet-Epp Buckingham, from Ontario, law professor, and religious rights leader who championed Trinity Western University’s journey to bring a Christian law school to Canada; and Christine MacMillan, also from Ontario, formerly a leader in the Salvation Army, and presently senior advisor for social justice, World Evangelical Association. Thank you for your testimony today at Palm Desert Presbyterian church. It was so inspirational, a testimony that I would love to share with family members and special friends.